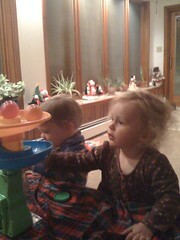 taylor had his friend Lilia over tonight and they were playing and having a good time! This saturday is Taylor's 1st birthday party and he is looking forward the music party with 75 degree sunny weather with al his friends and family! Also its been 1 year since we started this site to keep all our friends and family updated with pictures of taylor so we've decided to try out a few new site designs over the next few days! !